Mike Baird started hunting when he was 5 years old. He loved animals and everything about them. 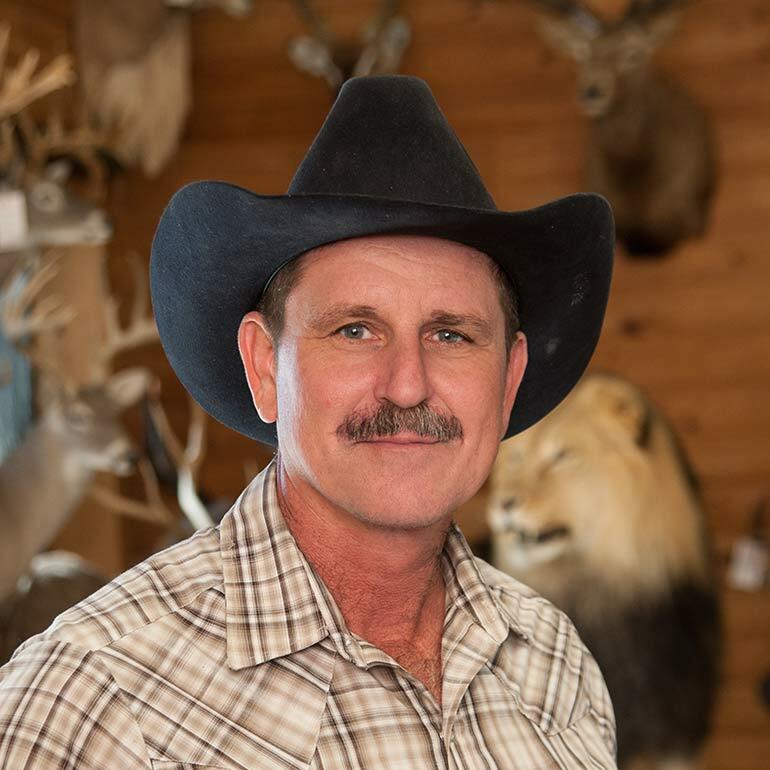 He took his first class of taxidermy with Kent Betts in 1979, in Ag Resource at Cy Creek High School. And that did it … he was hooked. 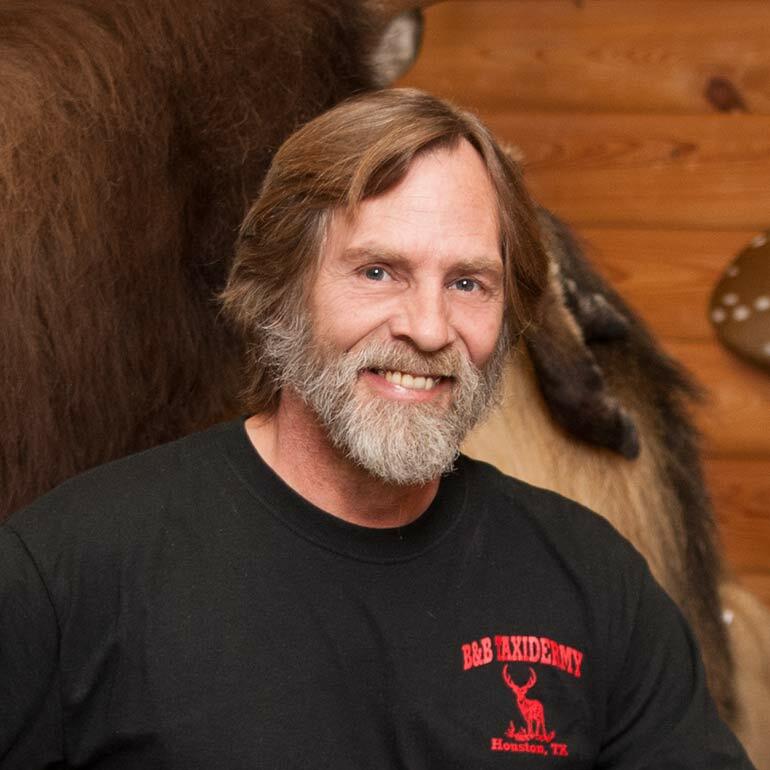 Mike continued hanging around a local taxidermist shop and helping with anything that they would let him do. He just seemed to be a natural for taxidermy. He studied the animals in the wild and knew what they should look like when mounted. Then in 1983 Mike started his own taxidermy business along with his good friend Leonard Bayer (the other B). Leonard was an avid hunter and had gone to Africa at least once a year. B & B has grown since its humble beginnings and now has grown into a thriving business, thanks to Mike's hard work and long hours. 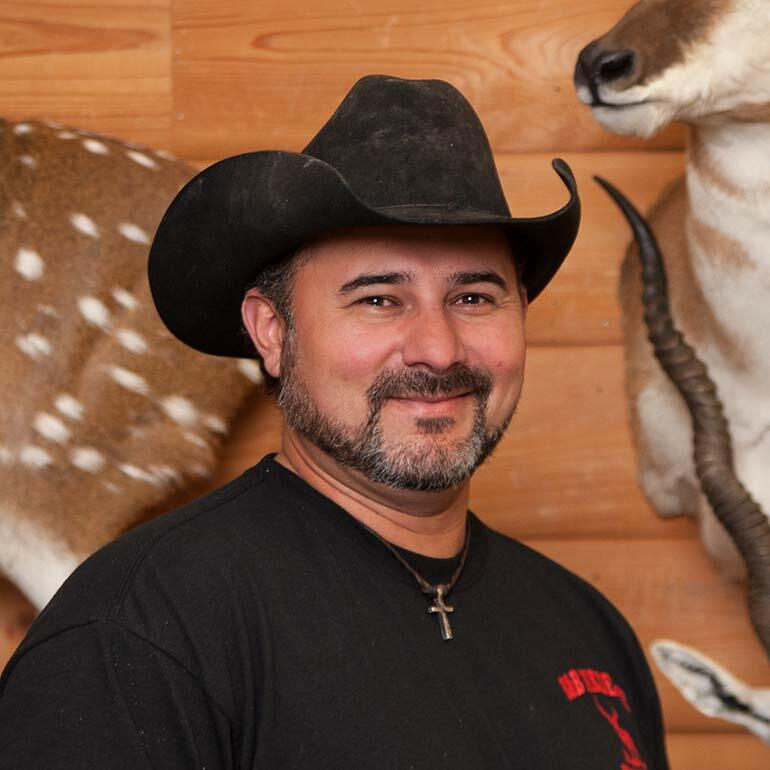 He now takes his clients and family overseas, hunts yearly, as well as doing lots of local deer and bird hunting. 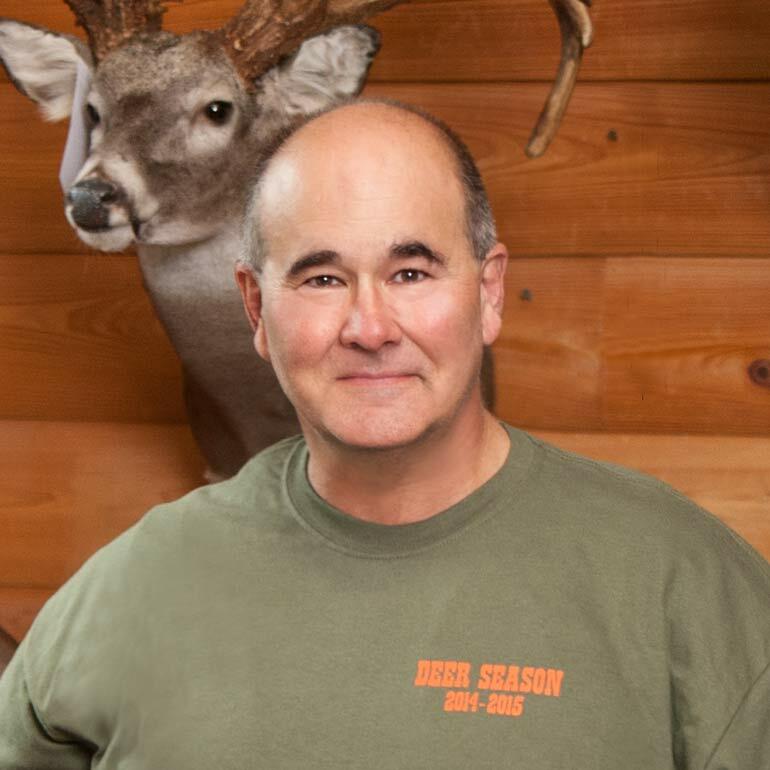 Mike still has that love for the animals, which shows in every mount that goes out the doors of B & B Taxidermy. Jo Baird - Mike and I married in 1982. He lost his job as a machinist 2 weeks after we were wed and did everything to find a job somewhere else. He came home one day and said "I'm gonna be a taxidermist!" Not quite understanding what he meant... I replied "What? Your gonna do taxes?" 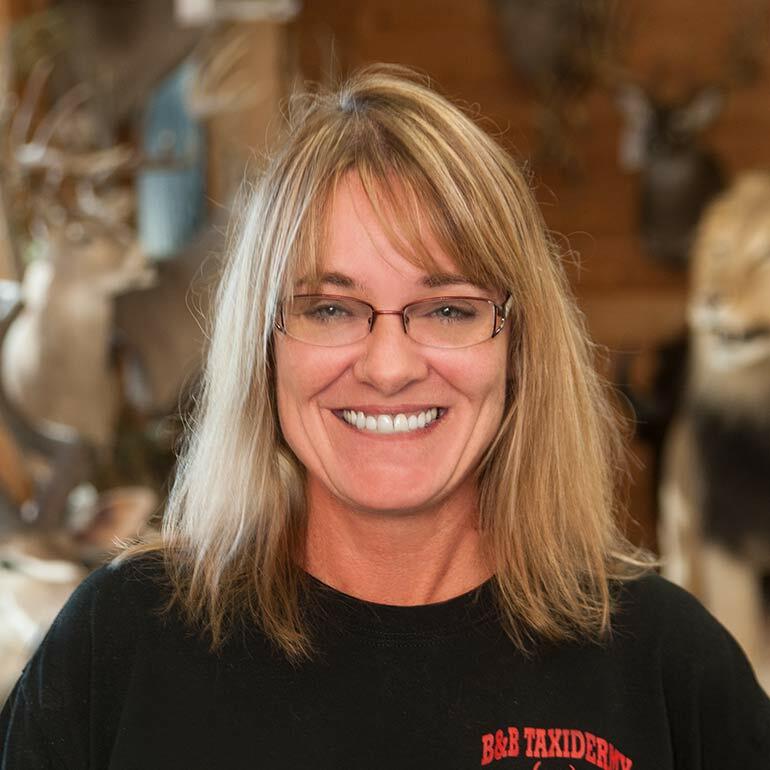 Needless to say I've learned a lot about taxidermy since then and our family business has treated us well. Frank Baird – Frank is Mike and Jo's son and he has been involved with the business since birth. Frank has traveled with Mike and Jo on many hunting expeditions to Africa and New Zealand, as well as many other hunting opportunities in the US. These experiences have helped Frank to have a more anatomical hand's on approach to taxidermy. He graduated from Sam Houston State University in 2011. Since graduation, Frank has been training to manage the company in his father's footsteps. He can handle any mount, from an elephant to a squirrel. 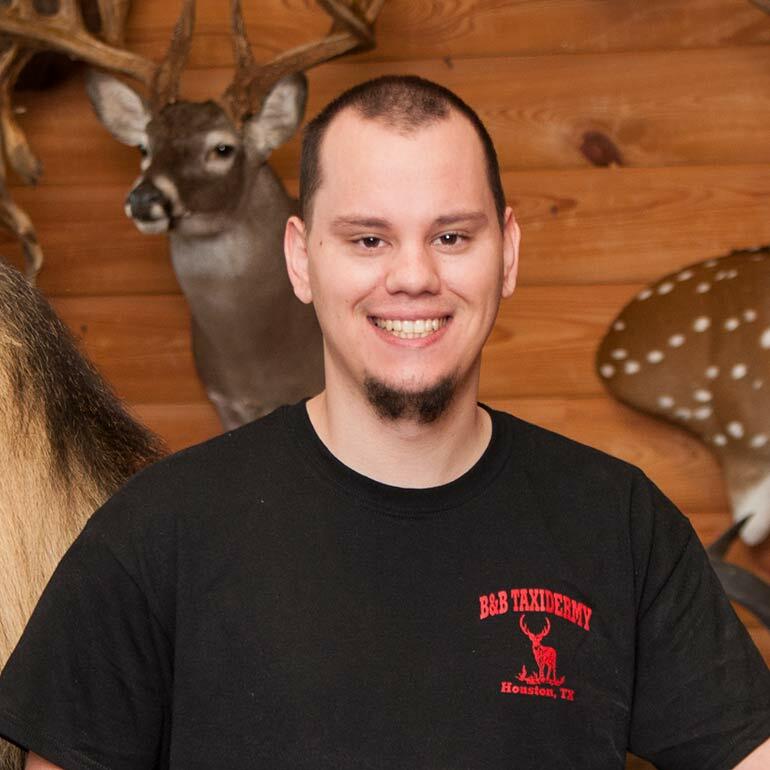 He has also been trained by Mike to design and organize trophy rooms, and to accommodate any matter in the shop. Heather is the newest member of our team. She works to run the day to day operation of the front office. Heather is the first person you will see as you walk through the door and the voice you will hear on the other end of the phone. Coming from a customer relations background, this young lady is a great addition to our family business. Fernando has been with B&B since 1990, and personally trained by the best... Mike Baird. He specializes in African game, but he is great with anything he touches. He is a great artist at his craft, and can make any animal actually seem to come to life in his mounts. Alex has been with B & B since 1996. Alex was also trained by Mike and Fernando, which is his uncle. It must run in the family, because Alex is an artist at this technique as well. He has mastered the art of mounting everything from birds to crocodiles. Kevin is a nephew of Mike and Jo's, and has been working with us since shortly after high school. We refer to him as our second computer. You can ask Kevin about anything, and he can tell you exactly where it is and usually the invoice number to match the customer name! His memory is amazing. Keeping up with all the skins, prepping them to go to the tannery, checking them in once they come back, and assigning them to taxidermist. Then of course mounting animals, and waiting on customers. These are just a few of Kevin's many duties. 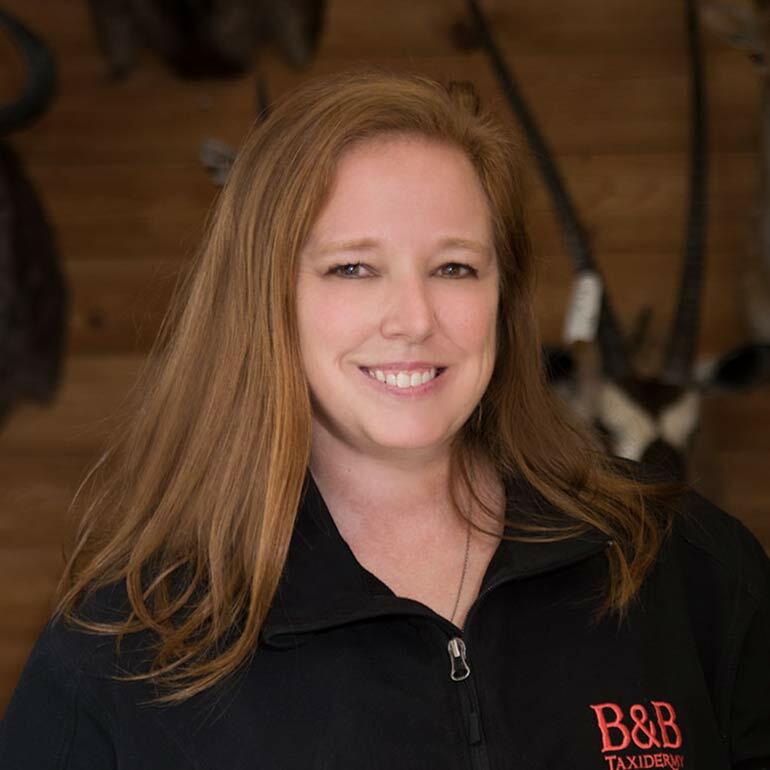 Meredith has been with B & B since 1998. We call her our 'make-up lady.' She adds just the right colors back to the animals. Meredith spends a lot of time setting all of the finishing touches that will make any mounted animal look so natural. She is a perfectionist at what she does, and there has been no job too big (or small) for her. Meredith has retired after a long career with us. 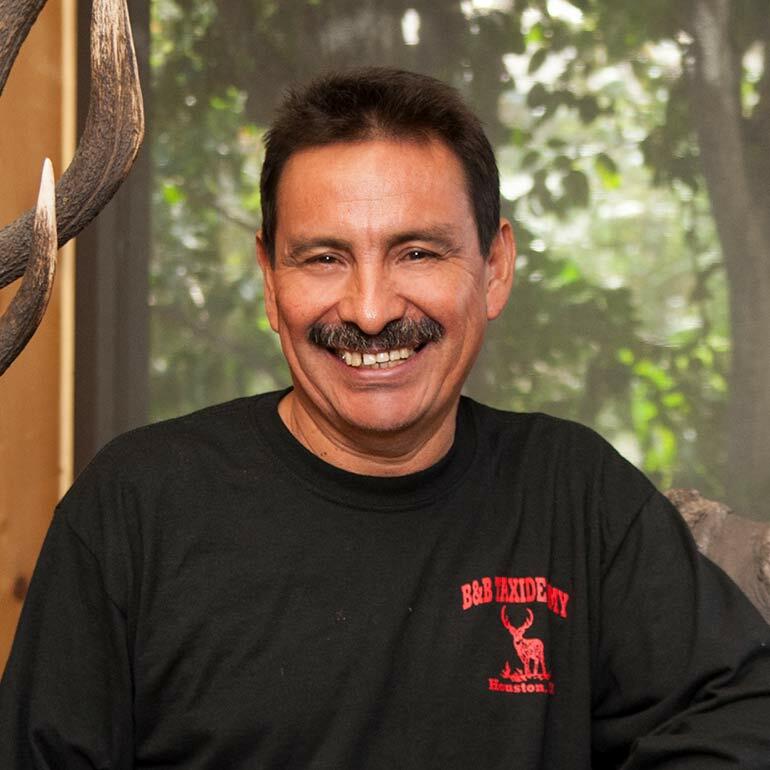 Willy is a remarkable individual and has been with B & B since 2001. He performs everything from skinning to building the crates, as well as the beautiful custom pedestal bases. Willly passed away in 2016. He, his laughter and hard work will be truly missed. God bless you Willy! 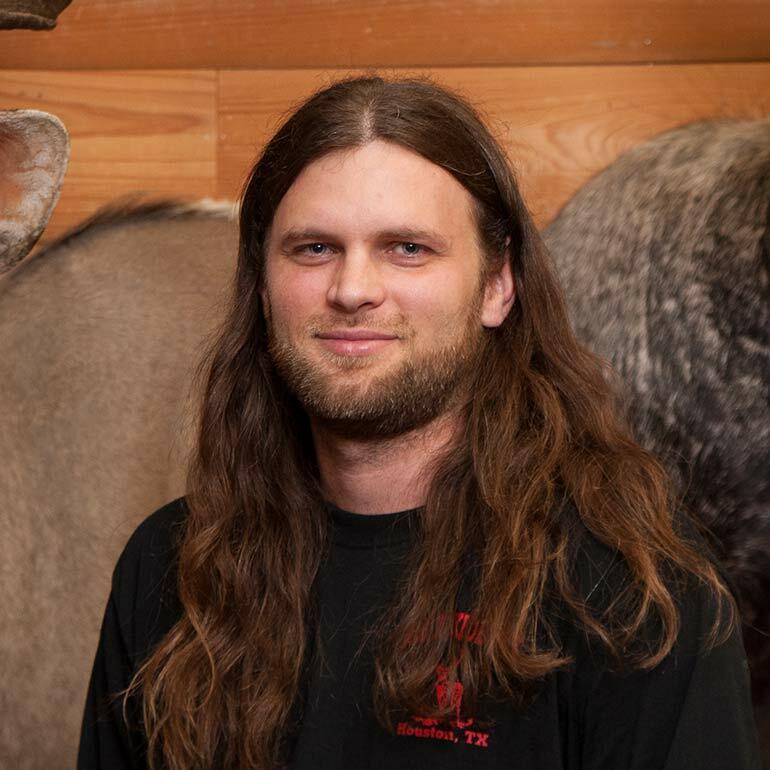 Joe has been an accomplished taxidermist for over 10 years. He has done every fathom of taxidermy from fish replicas to creating lifelike scenes with multiple life size mounts. 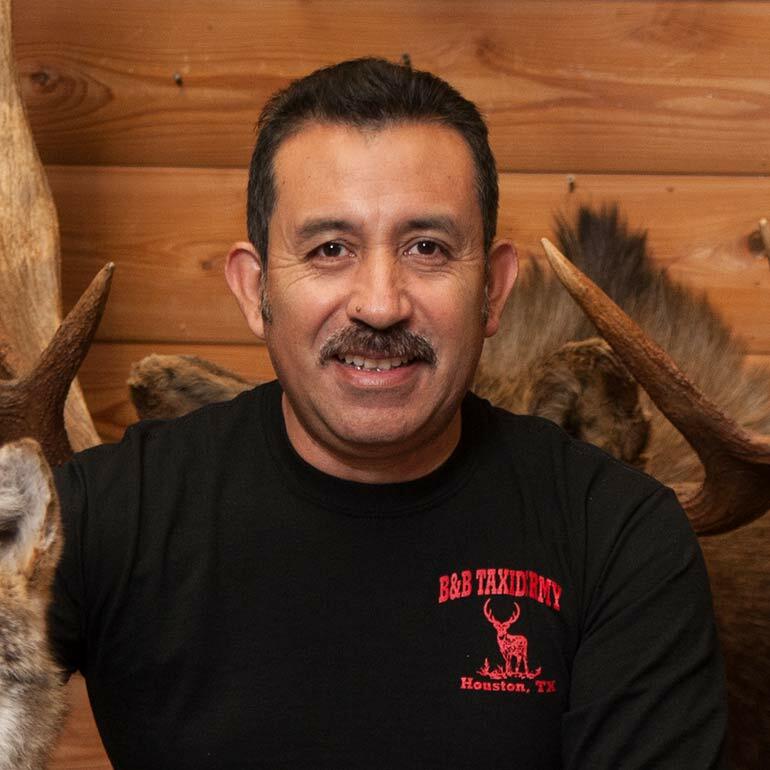 He has only been at B&B for 2 years but has earned the title of a do it all accomplished taxidermist. Joe has been a great addition to B&B, weather it has been mounting the everyday deer or tackling a life size lion or croc, there is nothing he can't handle. Robin has been with us since 2003. 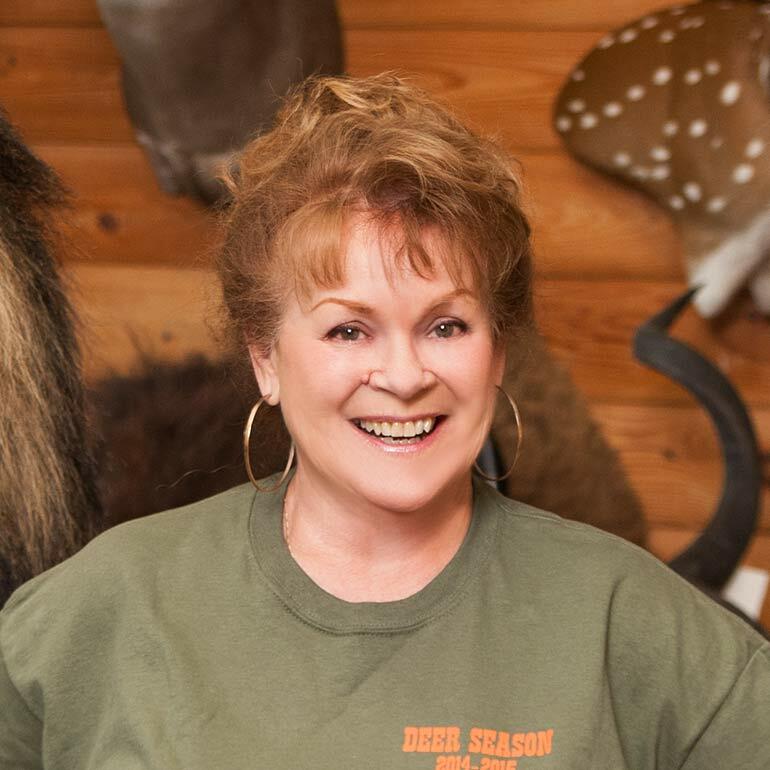 She mainly works in the base building department making one of a kind scenery for life size or shoulder mounts. 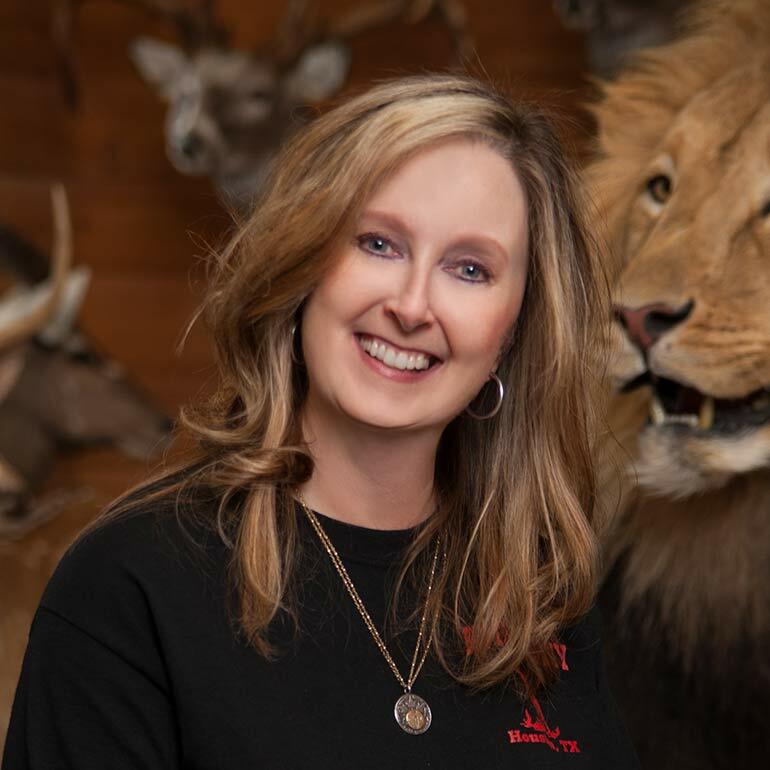 She is willing to do a lot of different jobs, including delivery and set up of large trophy rooms. 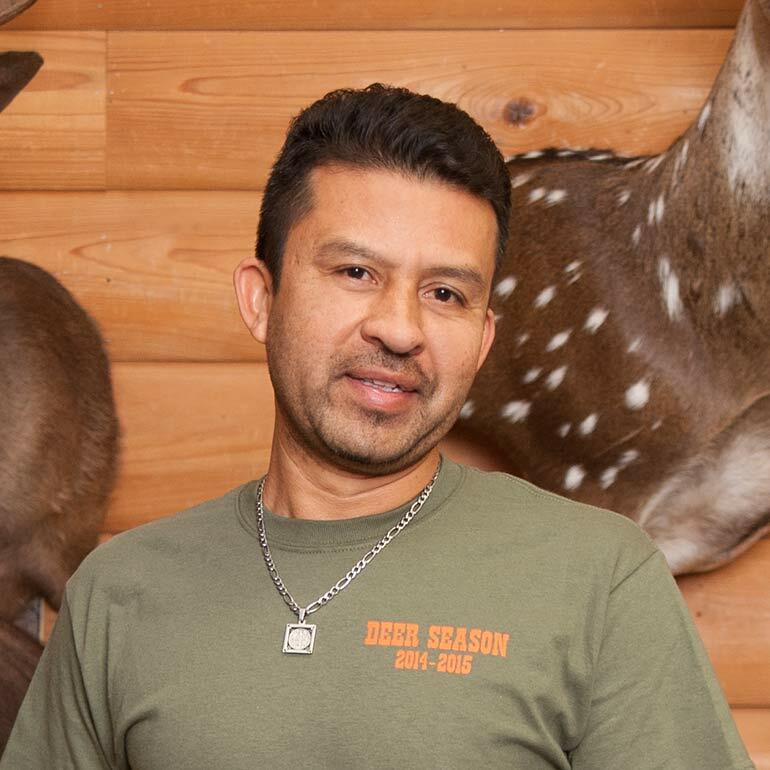 Chapa has been working for B&B since 2008. He is an accomplished taxidermist in all that he mounts. 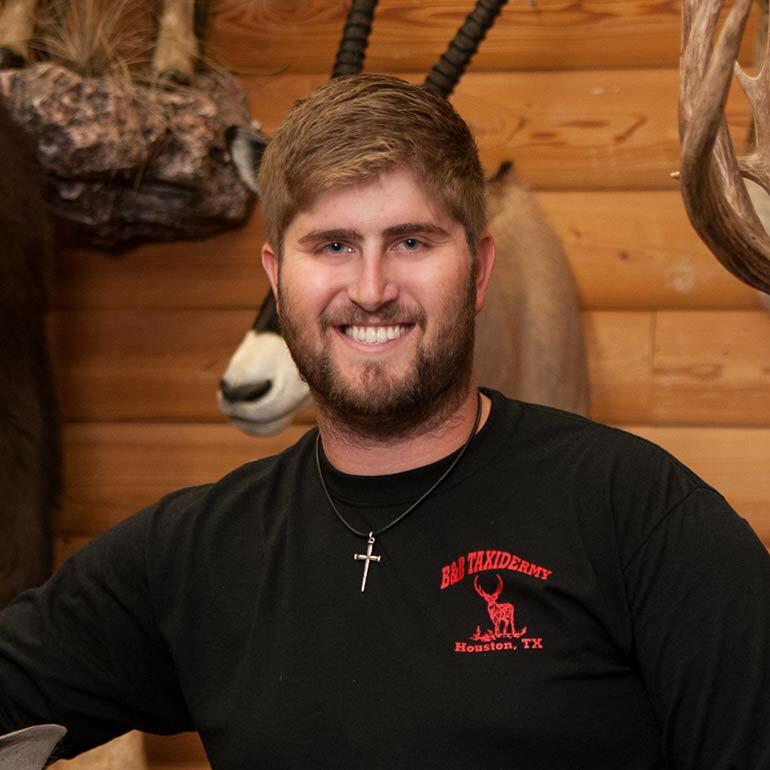 He concentrates on exotics and whitetails, but can tackle just about anything and is glad to help out with the customers if the secretaries are busy. Chris is a nephew of Mike and Jo's, as well as a brother to Kevin, and has been with us for about 6 years. Chris is a very detailed worker and specializes at the finishing touches on mounts and lots of rug work. He can fix broken tines were you can't even tell they have been repaired. Chris also helps with checking in trophies from Africa and preparing them to go to the tannery. John moved here from the Hill Country in 2012. He builds beautiful dioramas and scenery for life size mounts that will take your breath away. John uses new techniques and the latest materials to get natural looking effects. Nolan Conley - We have been using Nolan Conley Photography since 2005. He is a great guy to work with. Helpful in every way. Always does what he says and you can always expect a very professional job. Whether on location at our valued customers homes or at our studio he gets the shots. Website and print ads are always the best from Nolan. Reliability and consistency are his best qualities. We wouldn't dream of using another photographer! 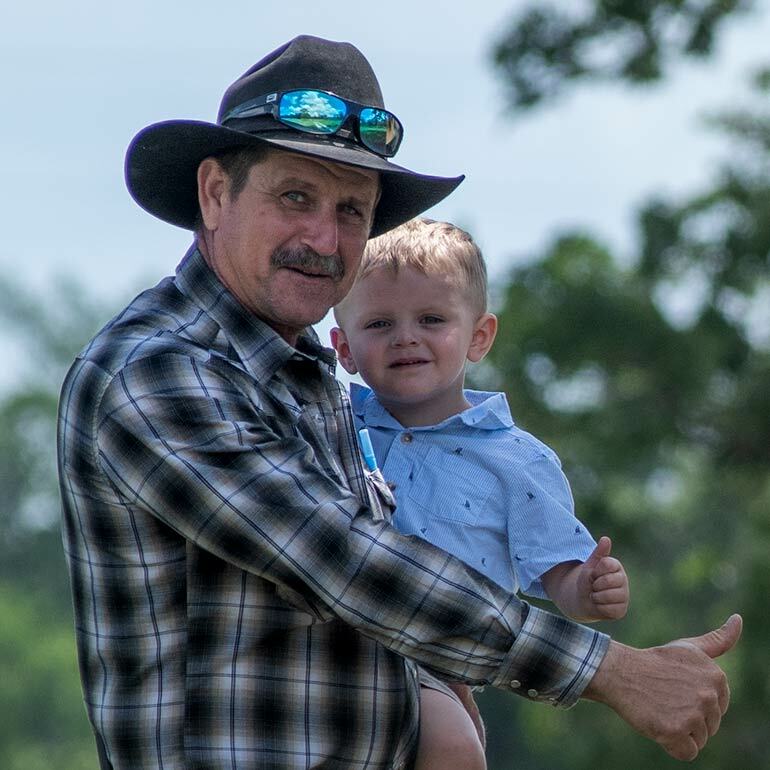 Hunter is a very promising member of the B&B Taxidermy family and is currently in training by his PawPaw Mike and his dad Frank.